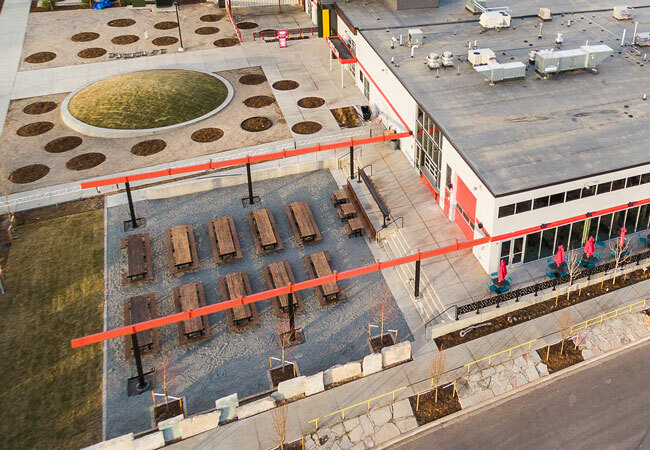 Denver — Ware Malcomb announced construction is complete on Stanley Marketplace located at 2501 Dallas Street in Aurora, Colo. Ware Malcomb provided civil engineering services for the project. The project features the adaptive reuse of an existing ejection seat factory and airport hangar that was transformed into a modern marketplace with over 50 retail spaces. The resulting collection of 50+ independently-owned Colorado businesses offers the community a place to eat, drink, shop, exercise, work, play, and more. In repurposing the site, the development employed a low-impact design and reused materials wherever possible. The General Contractor for the project was White Construction Group.